With both Bracknell cancelled due to a fallen tree and Rushmoor out of action, Parkrun Frimley Lodge was inevitably busy and saw 689 runners take to the course including twenty-four SJs. Neil Praine was first member to finish in 19:36. For one week only we’ll promote Woodley to a SJ regular Parkrun venue and six members made the short trip to the edge of Reading. Patrick Wadsworth was first home for the club in 22:36. Lot’s of local tourism and some diverse race-cations further afield. Charlie St Aubyn celebrated his 101st Parkrun at Reading TVP claiming his fastest time since 2015 with 21:26. A seasons best for John Tovell at home course Crane Park with 22:37. Will Lucas tackled the pebbly challenge of Seaton, Richard Boese was in action at Woking and Lisa Hale claimed her second quickest time of the year at Lee-on-Solent. Pam Moscrop ran the Edinburgh Marathon Festival 10k event finishing in 1:16:43. Leon Hicks, Richard Boese and Emma Lewis went out for a unconventional (well for most people but not for marathon runners) Saturday night at the Phoenix Saturday Night Trail Marathon. Sunday saw two SJs tackle relentless hills at the Women Can Marathon in Devon. Heidi Zymela and Alice Copeland ran brilliantly to complete their first marathons finishing in 4:30:18. At the other end of the distance spectrum Jim Casey recorded 6 minutes 39 seconds as completed the spectacular Westminster Mile. Polly Harris ran the Folkstone Coastal 10k event on an out and back course along the seafront starting in Folkestone and heading west towards Hythe before finishing back in Folkestone near the promenade. She finished in 1:02:53 for 20th place in the V45 category. 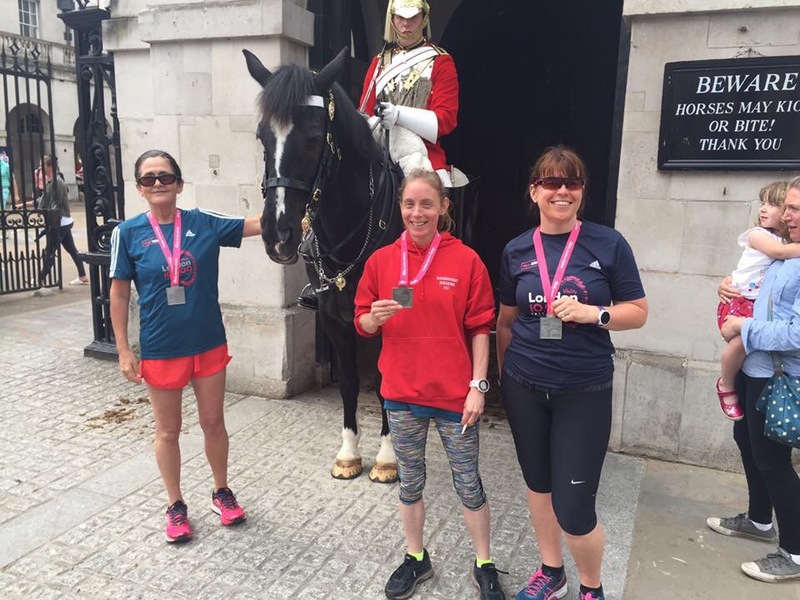 Twenty one members braved the London crowds on Bank Holiday Monday for the Vitality London 10k. A huge field took part and all members recorded some fantastic performances led home by Mark Fallowfield-Smith and Nikki Stanley. 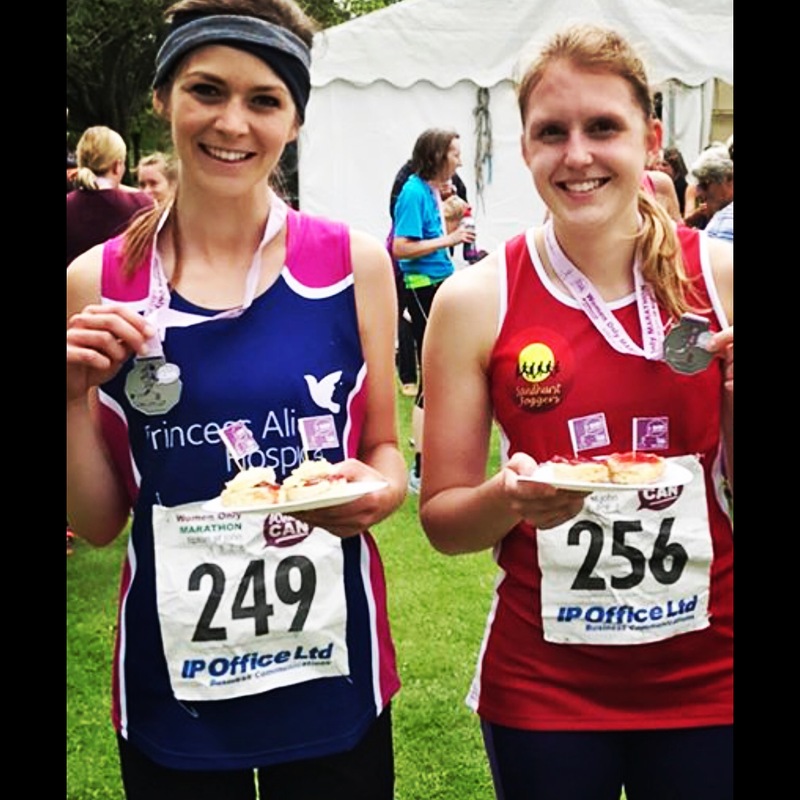 Sarah Alexander, Kate Parker and Karen Page all achieved PBs, whilst Royston Crandley bagged his best 10k in two years. Another Bank Holiday Monday event saw Dave Ayling tackle the Hatfield Broad Oak 10k, his first attempt at the distance in 2017. Dave recorded a great time of 42:18 for 100th place overall out of the 1222 runners. Inevitably Graham Meeks claimed this week’s Strava leaderboard win with a huge total of 111.5km! Lisa Hale was 2nd with a paltry 77.8km and new marathoner Heidi Zymela made her first podium appearance in third with 56.3km. Sixty-nine members logged runs this week which is the biggest number ever. To take part in this just create a free Strava account and link it to the club in your profile. Monday: If you are quick you’ll still be able to get to the Monday night chatfest leaving from the Sandhurst Sports Centre at 7:30pm. Patrick has an access card now to get in and use the facilities. Regulars and ‘Club run tourists’ are welcome and hopefully Bank Holiday will make it possible to join if work normally gets in the way. Tuesday: Multiple groups running on Tuesday from Sandhurst Memorial Park starting at 6:30pm. Later at 8pm you can meet at TYTHINGS, Yateley for this week’s intervals which will be a Pyramid session at Blackbush airfield – 1 x 5 minutes, 2 x 4 minutes, 2 x 3 minutes, 2 x 2 minutes, 2 x 1 minutes. Thursday: This week the threshold/improvers run will be taking in the local countryside with another stunning off road route. Nikki will deliver the details along with her usual day brightening humour on Thursday.